In my score I concentrated on illustrating how both the nature and people in the photo had a similar connection through the level of freedom they had. The waterfall has a great amount of freedom in the way the water falls, the gushing sounds and rhythms it creates and the energy it provides. As a result of this photo being taken in late June, the people in the photo have a newly found freedom away from exams and the pressure of school and career choices. When I look at this photo I associate with it words such as independence, youth, summer and vibrant colours. 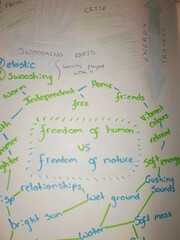 Through this sense of freedom, I feel that nature and humans share a common relationship.